Business Friend: This service is based on the research that shows that the owners/managers of small to medium businesses often have the desire to have an independent person/ Mentor they can confidently discuss aspects of their business be they issues or opportunities and explore possible solutions to the benefit of the business. The Key Business Enhancement Program has Mentors with a wide range of business experience across many industries. The allocation of a suitable Mentor is undertaken after an assessment of the owner/managers needs and is reviewed periodically to ensure that changing circumstances do not mean a need for a change of Mentor. The service will be tailored to the individual requirements and expectations of the business as agreed by the Program and Mentor. Review: Regular reviews are carried out against the key measurable milestones with the Mentor and where appropriate adjustments are made to the Action Plan to accommodate unforseen events and changes to the environment. 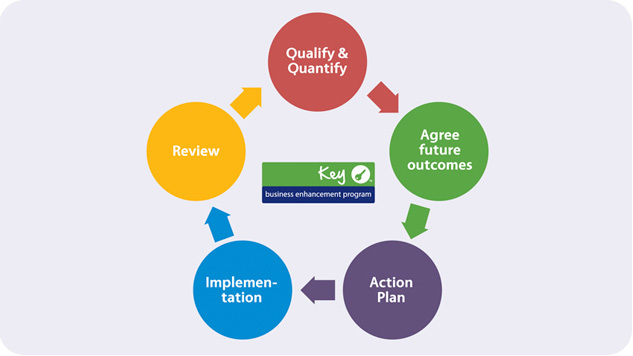 Qualify: At the end of the Action Plan a further independent health check on the business is carried out to give an independent verification of the Action Plan. Agree to pay a monthly fee of $265, or $115 session fee including GST, while they participate in the program to help offset the costs of providing the Program. Contact Us: for more information.